On May 10, 2014, five College of Charleston students will become the first graduates in South Carolina to earn a Bachelor of Arts in Archaeology. They plan to be museum curators, tour company owners, and to use their geoarchaeological knowledge to travel the world working on excavation sites. In the fall, Coleman will begin the Masters Program of Environmental Archaeology at University of Umeå in Sweden. She is one of the program’s first five graduates, along with James Boast, Corey Heyward, Steven Paschal, and Caroline Weber. RELATED: Four real-life lessons learned through archaeology. 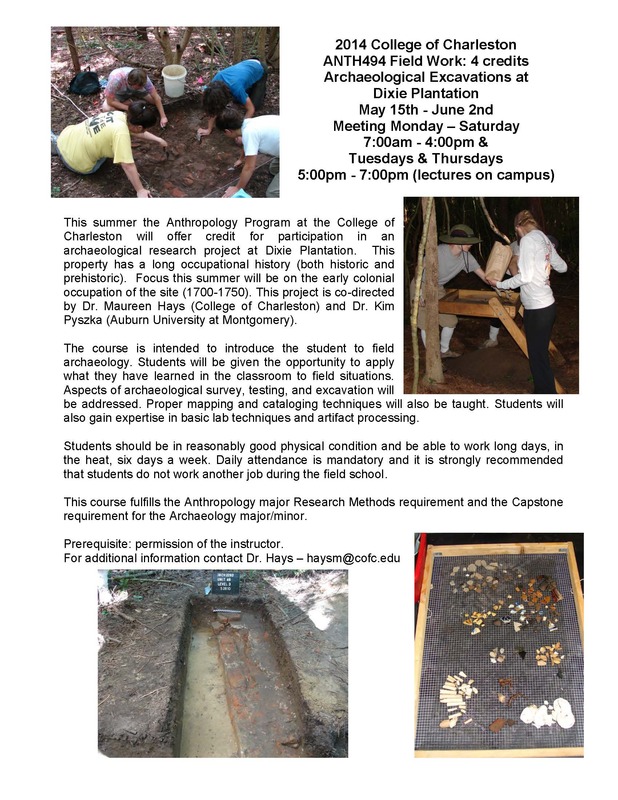 The archaeology program includes professors and courses from four different schools within the College of Charleston. Plus, students are required to do either an internship or participate in a field school – a hands-on experience that all the graduates enjoyed. RELATED: Watch a video of the Archaeological Field School at Dixie Plantation. RELATED: Read the College’s archaeology blog. The College of Charleston has offered a minor in archaeology for many years and since the archaeology major was approved in fall 2013, it has exceeded expectations, growing to more than 35 students.